A few weeks ago, my husband and I travelled back to Wisconsin to help my Mom move from the nursing home where she had been for the previous ten months, into an assisted living room. Throughout the whole process, she never ceased to teach me invaluable lessons of grace, acceptance and appreciation. She had gone to the gift shop in her senior community and purchased the sign you see in the photo above as a treat for herself. 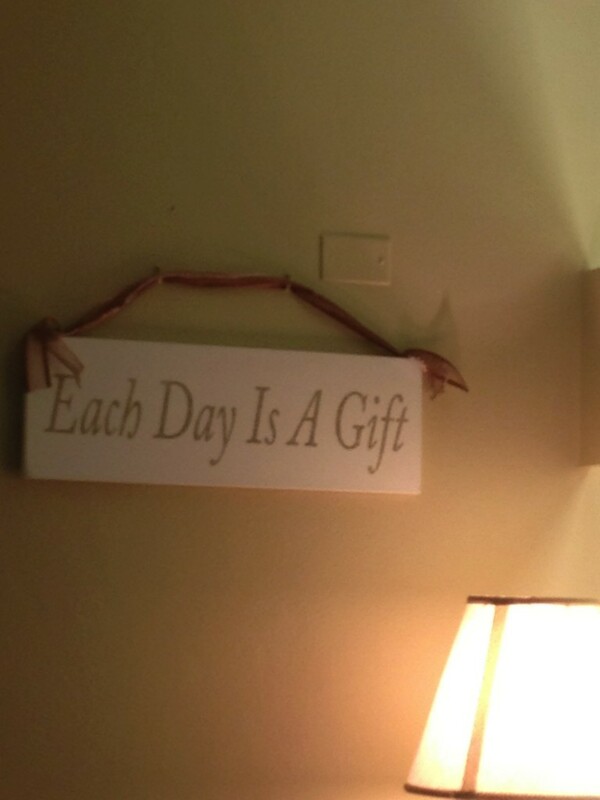 She talks about the sign frequently, saying how much she really believes that each day is truly a gift. An easy thing to say, but she lives it. She finds beauty in the smallest moments. She has lost so much in the past year and a half – her ability to walk, her home, her independence, her long-term and former live-in boyfriend is slipping away to advanced dementia, her ability to drive and to travel, her ability to write, or use her computer. But all she talks about is how much she adores her 14 x 15 foot room, how lucky she is compared to others in her exercise class because she can lift her arms (she doesn’t mention that she’s in a wheelchair), how happy she is hearing my voice, how beautiful the trees are outside her window, and a million other little moments. Do you have people in your life you admire? Tell me their stories. This touched our hearts, how beautifully you have described your Mom. She is an amazing lady and she has one of the Best daughters in the world.